Star Trek’s been around forever. We’ve all watched it, all our parents have watched it, and maybe even our grandparents have watched it. There have been 12 films, six series … it’s impossible to stay away from it completely. Even if you think you’ve stayed away from it, you’ve probably witnessed a reference, especially if you like any of the celebrity Trekkies listed below. Yeah, they’re pretty much just one being. It really shouldn’t come as any sort of surprise that Matt Stone and Trey Parker, the men behind South Park, are huge Trekkies. There have been references not only in South Park – such as an episode titled “City on the Edge of Forever” – but in the films they’ve been in. In BaseketBall, for example, they quoted a small, well-known part from The Original Series. Their love for the show has also been mentioned in several commentaries for South Park episodes. Dawson has on several occasions mentioned that she is a huge Star Trek fan. She’s referred to it as her favourite thing in the world. 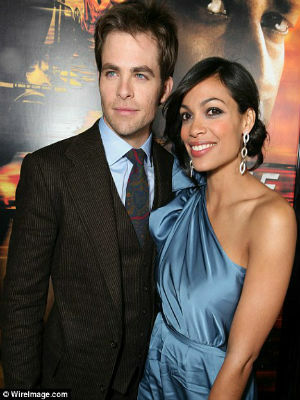 When she worked with Chris Pine on the film Unstoppable, she mentioned that she wanted to make a petition on Twitter to get herself into the next Star Trek film, which Pine would star in as Captain Kirk. She said that it’d be great if she could speak some Klingon, but as long as she’d be in the movie, she’d be happy. No matter how hard she tried to hide her love for Star Trek from her co-star, the news eventually came out. Maybe he’ll put in a good word with J.J Abrams. Jolie has admitted to enjoying Star Trek, but her case is rather specific. She’s admitted to having a crush on Nimoy’s Spock from The Original Series. She found that he seemed repressed, and she simply wanted to make him scream. There were also rumours that she’s been a guest star on The Next Generation, however this was false (she clearly has to try harder, like Rosario). Mila’s actually quite the geeky lady. An ex-boyfriend introduced her to World of Warcraft and she got rather addicted, for one thing. For another, she’s a very honest, very big Trekkie. She got into it in her late teens and never fell out of love, once saying that one never gets over Star Trek. She’s been to The Star Trek Experience in Las Vegas, and she has Leonard Nimoy’s autograph. She knows her favourite – and least favourite – series (her favourite is The Next Generation). Mila admits that she and Family Guy creator Seth MacFarlane have argued over Trek-oriented opinions more than once. 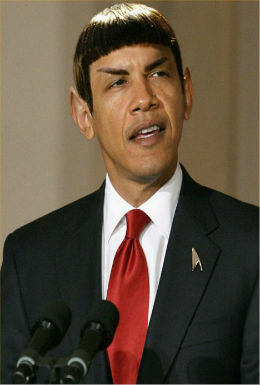 The most important fact here is that Obama is the same age as Star Trek. It is true, however, that the 44th president of the United States of America is, in fact, a Star Trek fan. He’s noted that he grew up watching the show. He’s even made references to it during political speeches. The Vulcan salute has been exchanged between Obama and other political figures, as well as Leonard Nimoy himself. He isn’t the first presidential Trekkie, apparently – it’s been hinted that Reagan was one as well. How many of these were you surprised by?